Getting to the UW is actually not that hard, but because we want to make sure you get to the right door of the right building problem-free, these directions are on the wordy side for completeness. Which building am I going to? For the Thursday evening dance social and daytime symposium sessions, you're going to the Meany Hall dance studios. For the Day of Dance program and the Friday and Saturday evening dances, you're going to the Mary Gates Hall Commons. For on-site lodging, you're going to McMahon Hall; see specific driving directions below. Take I-5 to exit 169 (just north of the Ship Canal bridge). Follow signs for NE 45 St. At the traffic light at the end of the ramp, turn east (if you were on northbound I-5, turn right; if you were on southbound I-5, turn left). Continue eastward on NE 45 St for just under half a mile. At 15 Ave NE (one block past University Way), turn right. Continue south on 15 Ave NE for three blocks. At NE 41 St, turn left into the UW Central Parking Garage. Pay for parking at the gate (see rates here); tell them you which building you are going to. Park in the designated area of the garage and leave your permit on the dash. If you are going to the Meany Hall dance studios, look for the doors labeled "Meany Hall - Meany Theater" (not Studio Theater) near the ramp in the center of the garage. Go through the doors, follow the ramps to another door, and go through that door to an elevator lobby (if you end up back in the parking lot, you went through the wrong door from the ramps). Take the elevator on the right up to level P (the elevator on the left does not go to this level). Exit the elevator, then exit the building and cross the short bridge. Turn right (but do not go down into the lowered plaza). You'll see "DANCE" in the windows of the dance department ahead of you. 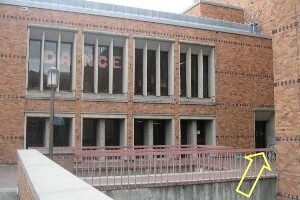 Below these windows to the far right is the entrance to the dance studios (see photo below); go in the door and up one floor of stairs. If you are going to Mary Gates Hall Commons, look for the doors labeled Gerberding Hall - Suzzalo Library at the far corner of areas C1/C3/C5b. Walk up to the top of the stairs. Once you're outside and on the path, walk away from the large plaza, going down some steps. Mary Gates Hall is the building ahead of you on the left. Enter through the front door (see photo below); the Commons where we'll be dancing is just beyond the lobby. If you do not wish to pay for parking in the garage, you can follow the directions above, but instead of going into the garage, look for on-street parking in the neighborhood of 15th Ave NE and NE Campus Parkway (one block south of the garage entrance at NE 41 St). This is limited, especially during the day. After you park, walk across the skybridge at Campus Parkway. At the top of the bridge, go straight past the statue of George Washington. Meany Hall is the building on your right. 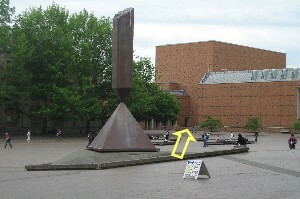 Do not enter the main lobby; instead, continue straight to the far side of the building; you'll be at the edge of a large plaza called Red Square. If you are going to Meany Hall dance studios, turn right, and continue along the building without going down into the lowered plaza. You'll see "DANCE" in the windows of the dance department ahead of you. Below these windows to the far right is the entrance to the dance studios (see first photo above); go in the door and up one floor of stairs. If you are going to Mary Gates Hall Commons, walk across the plaza, going between the large gothic building across from you (Suzzalo Library) and the grey gothic building to your right (Gerberding Hall). Follow the path down some steps. Mary Gates Hall is the building ahead of you on the left. Enter through the front door (see second photo above); the Commons where we'll be dancing is just beyond the lobby. As part of your lodging registration confirmation, you should have received driving directions from UW Conference Services. These are reproduced here for your convenience. These directions reflect the construction project near the dorms. Take Exit 169, NE 45th St. and turn east onto NE 45th St. Travel east on NE 45th St. to 17th Ave NE and turn right onto campus. Stop at the parking gate to purchase a permit if it is open, or proceed to Stevens Way and turn left. Follow Stevens Way until you reach the construction. Turn left into the N6 parking lot and proceed until you reach Whitman Court. 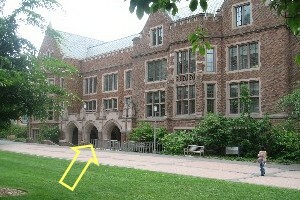 McMahon Hall will be to the right. The current daily rate for parking is $11.00 Monday through Friday and $5.00 on Saturday; 7a.m. to 12 noon. There is no charge to park on campus from 12 noon on Saturday to 12 midnight on Sunday or holidays. A few parking areas near the residence halls are assigned on a first-come, first-served basis. The parking rates are subject to change without notice. You will be required to purchase a daily parking permit upon entrance to the campus (except Sunday and Holidays). Long-term permits, valid for the duration of your stay, will be available for purchase at the residence hall desk. 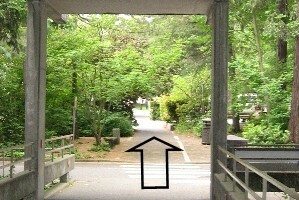 Exit McMahon hall, cross the sidewalk, and follow the path through the trees. You'll come to a crosswalk. 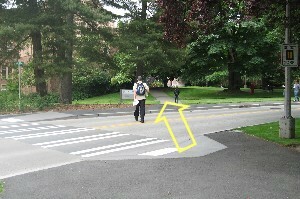 You want to keep going straight, but you have to dodge left across the sidewalk, then dodge right in front of the Music Building sign, before you can continue along the path. The path takes you to a patio that overlooks The Quad. 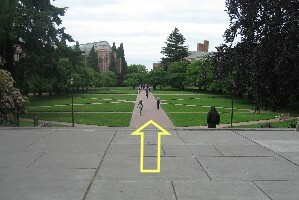 Follow the main path straight down the middle of The Quad and out the far end. You'll then see a geometric sculpture in the middle of Red Square. Meany Hall is on the far side of the Square. Aim for this door (see top photo above for a closer view). Once you're in the building, go up a flight of stairs to the Dance Studios. If instead you're heading to Mary Gates Hall, when you get to Red Square, bear left at the balanced pencil, going between the large gothic building across to your left (Suzzalo Library) and the grey gothic building to its right (Gerberding Hall). Follow the path down some steps. Mary Gates Hall is the building ahead of you on the left. Enter through the front door (see second photo above); the Commons where we'll be dancing is just beyond the lobby.